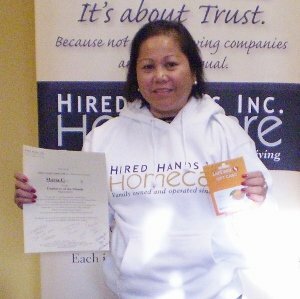 Maria has been a dedicated Hired Hands employee since 2006. Her devotion to her clients is her number 1 priority. Maria is an excellent communicator when it comes to keeping Hired Hands management aware of her clients various needs and change in condition. We want to congratulate Maria for doing an amazing job everyday and especially for being such a star!! Maria – we tip our hat to you. Thanks so much for ALL you do!